This is is pretty fun, but I'm stuck on level 31. Enjoying this more due to less chance aspect, more logic. 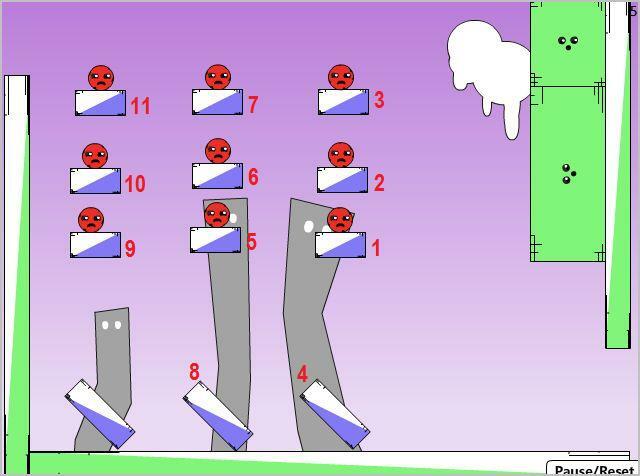 The screenshot and the first few levels indcate this is a balancing type game like so many previous ones. But after the initial levels it turns out it's that in fact it iosnt - but a game of timing. The levels are usually easy to understand and success depends on whether you can click on an item in the right moment. Well, that's a type of game, of course, I just don't like it that much bacause it's like pixel hunting - you have to find that VERY pixel/moment. Of course, that i don't like this kind of game isn't the game's fault, and otherwise I found nothing bad about it. The levels are not too hard (at least the first 20-something, that's where i had enough of time-pixelhunting :D), the turorial levels are well implemented. Has great potentials but needs polish. The unusual gravity platform is a novel concept. Lvls are interesting but too easy. A score system would be nice. I only played it briefly, but I found the first ten levels or so tons of fun. I'll play through the rest when I have more time. I didn't notice any pixel hunting, to me that's one little spot on the screen that you need to be extremely precise in hitting, these were all large boxes. =/ There was some timing involved (I assume it gets harder as levels increase), but that's why I love level reset. I'm probably slightly biased in that puzzle games usually aren't my thing unless they're fairly easy. I can't beat 29 to save my life...and I'm at work, so the video walkthrough is blocked...any hints? I played quite far into the game. Somewhere in the late 30s. I couldn't beat the level with the nine red balls that had to roll out of the area before two green blocks got in the way. I'm on a laptop and can't seem to move my mouse fast enough. The game is okay but more importantly, The last Casual game competition was over a year ago. Previous competitions have had as little as 4 months between them. Why is number six taking so long? It doesn't make sense to me. The competitions have in my opinion always been the best part of JIG. Is it a problem with sponsors? I hope the community is as anxious for a new competition as me. If this is the case, then I believe we deserve some explanations as to why this competition is so far away. I can't seem to get the par on level 31. any ideas? Clicking the right block, allowing the red square to fall up. It topples the green rectangle. 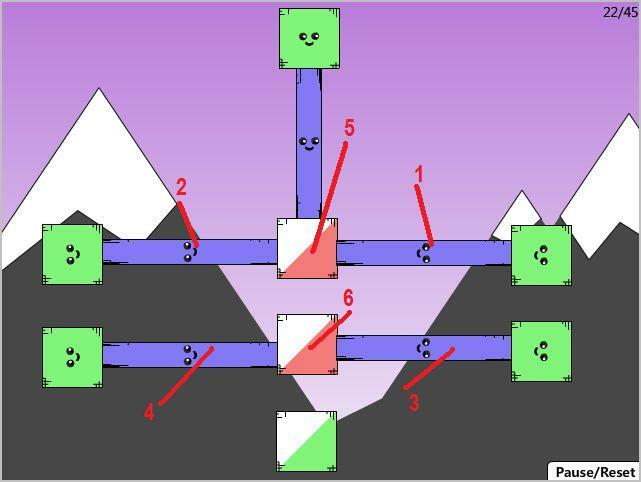 As the green block begins to fall, click the upper left block, releasing the blue square, which falls and prevents the green block from sliding off the small platform. That level is one that unfortunately does depend on getting a lucky bounce. Does anyone have any hints for 23? Nigh impossible with a touchpad, but I'm sure that's no surprise. I didn't mean pixel hunting, I meant exact timing is like pixel huntung because you have to find the right spot/moment. Of course there is no pixel hunting in this game! Sorry if I wasn't clear enough earlier. anyone speak Russian know what it is that's said at the very end? or morse code to know what that part is saying? I loved the kids' "Yaaay!" Cute effect. Where is the link to open the game in a new tab rather than a new window? Hrmph! What's up with the ppppbth noise when you fail? Love the fart sound when you screw up. I had fun with my girlfriend in the other room for about five minutes. She was convinced I was very, very gassy, until I pointed out that every poot sounded exactly the same. Funny stuff! Blew through it until level 29; I may be here all day. Hint? Here's a screenshot of what you need to make par. When doing this, once you click on 7 and the bar goes flying immediately click on 8. If you want to be safe remove all the blue balls left in the stacks, but you won't make par. How do I get par on 31? Anyone? Here's a screenshot of level 31 par. This was entertaining, though I beat the whole thing in about 40 minutes. I quite like the "4-plane-gravity" thing that you get going on after the first batch of levels, makes things a little more interesting. I am the kind of person that likes a good logic puzzle, and this will give the grey matter a mild workout. The levels are never too taxing, keeping it from becoming one of those games that becomes tedious after a while and just end up abandoning. However I think it could do with being a bit more adventurous, a little more complex on some of the levels. The added bonus feature that you get is quite nice, along with the PAR challenge. Small things to give it some playback-ability. But the thing is, once you've solved the puzzle, it becomes pointless to do the level again! In all, a nice little game, good for taking a break from some work or something. A nice way to warm up the brain and get those logic juices flowing! Open in a new window. Click off of the window, and the black-out disappears. Great for timing levels. I got par on solvaball. There are a lot of balls, so I will be general, and it might still take a few tries. Make the outer green balls fall to the outer pegs, this will take 2 clicks for each side. GAHHH! level 39 on the peephole thing is so hard! Great casual game here. I really liked the multiple gravity planes, the variety of puzzle designs, and the sound effects. , which was just an annoyance. completing all the bonus levels gives you a little prize, but completing them golden + on bonus mode does not. How do you get par on train tracks or level 35? To point you in the right direction, you can use the pink blocks to get the red block off the screen before it even gets to the right half. I've beaten lv44 BELOW PAR!! 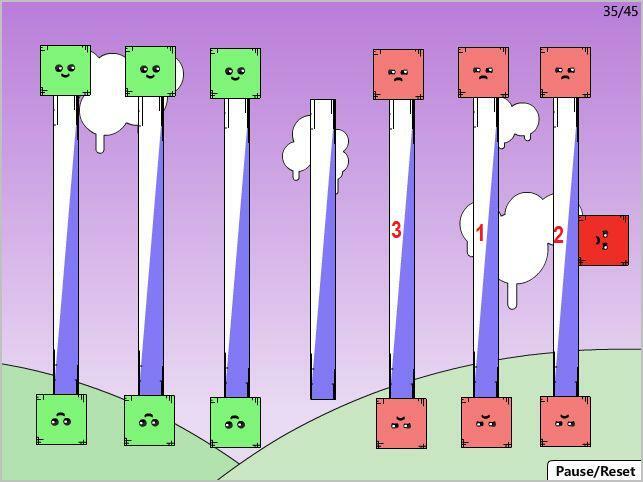 Some levels requiring timing, which is annoying in a logic game, but the timing isn't very precise. I didn't have to do any pixel hunting on the time axis. Once I figured out the order of events, almost any rough timing works. 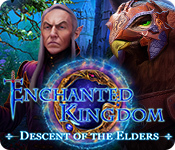 I thought this game was extremely enjoyable and a refreshing spin on the balance genre. 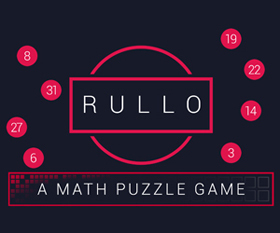 I thought the levels were very well constructed as puzzles which took a few seconds (to a bit longer on some levels) to work out but provided just the right amount of satisfaction when they were solved. The graphics and fx and faces and bonuses were all great too. Quite a fun game, the par mode was ok for adding replay value, but not particularly good as with most of the levels you do it in par anyway and the rest are for the most part easy to figure out. The bonus mode is just an annoyance, I didn't find it made it a lot harder and so it was a bit boring to have to do all the levels in bonus mode to unlock the last 5 levels. Also I was hoping the last 5 levels would be a lot harder than they were, especially when the game says "good luck beating them". All but one of them I did on the first try. Overall I like the concept, but with the concept a better game could have been produced. The music is great. Make it loop! Every time I noticed there was silence it distracted me from the gameplay. Make the Try Again and Reset LVL button positioning consistent. Give an award, or at least a different colour on the level icon if completed under par. Begin with the second face style, the original one feels more like a bonus as it's more expressive (and I prefer it). Right, time to try some user-made levels. How do you beat level 41? I beat it before but i cannot remember how. Понимание, говорит и показывает Москва. Работают все-сентралные каналы телевидении. Смотрите и слушайте Москву. Attention, This is Moscow calling. Operating on all television stations. Watch and listen to Moscow. how do you do lvl 40? The gravity sets this apart from other remove-the-pieces logic and stacking games, and turns this into something quite unique... and many of the solutions are very clever. Click on the first one, then wait for everything to topple. Once everything has stopped moving, then click 2. After all that as fallen then you can click the rest. 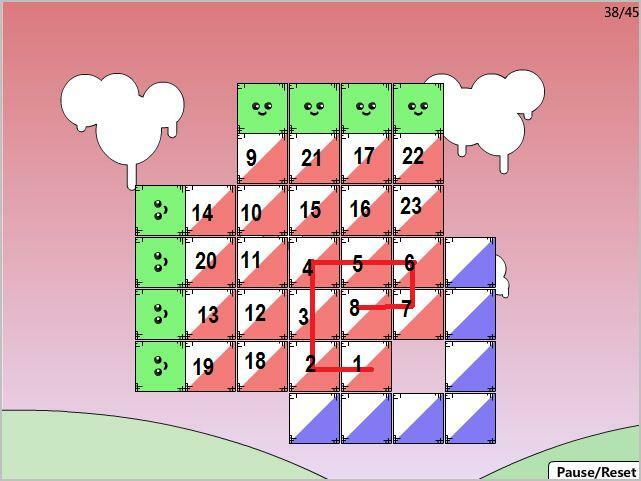 Screenshot for level 41. The timing is very tricky. Click 1 and the big red block pushes the little green block up between the two small red blocks. Then click the big red block (2) while the green one is still going up. Wait just a second, then click 3 so that the green bar drives the little green block over to safety. Then you can click 4 and 5. It may take a little while to get the timing down. It is possible to do both 33 and 20 on par, it just might take several tries as the timing is dead tricky. Start with the sides. Start on the right and click the top and bottom blocks of the line of reds on the right. Continue clicking top, bottom, top, bottom, until you are left with one red underneath the green. Then you can click those two reds away and the green will fall to the middle block. As you do each side remember to alternate between each end or the line will unbalance. I CANNOT do level 36!! I've done it like 8 times!! Some one help!!! Love the game though! SO addicting! Here's a screenshot of level 36. Click in the order noted and enjoy. Help! I can't beat level 38 for the world! It looks easy but what is the trick?? Here's a screenshot of my solution for 38. Your mileage may vary. How do you turn the green levels gold? I have 5 green levels on red remover and the rest are gold. 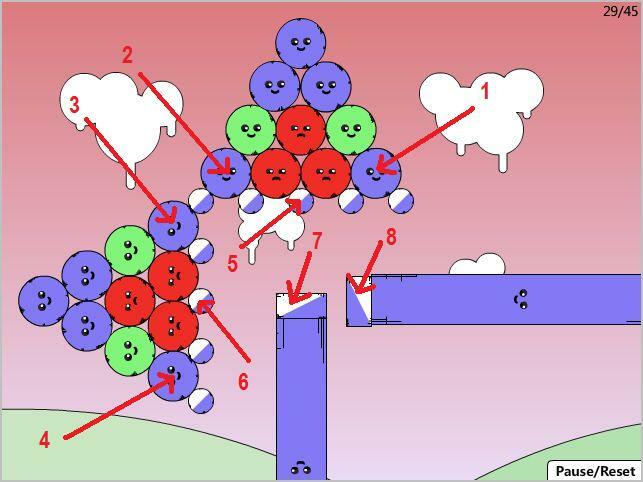 two clicks on right outermost blue balls, this will cause the green ball to sit between the pegs. Do the same for the other side. Starting with the third peg in, click this one and the next and one ball causing that side to fall, same on the other side. anybody know how to do lvl 25 on par? anybody know how to do 44? I need help with level 37. I beat the game completely, no walkthroughs!! How do I do Level 21? Help!! i need level 22 in par for red remover game. Here's a screenshot of how I do level 22 on par, it works most of the time. For level 29 here's a screenshot of what you need to make par. When doing this, once you click on 7 and the bar goes flying immediately click on 8. If you want to be safe remove all the blue balls left in the stacks, but you won't make par. I need help on level 33. 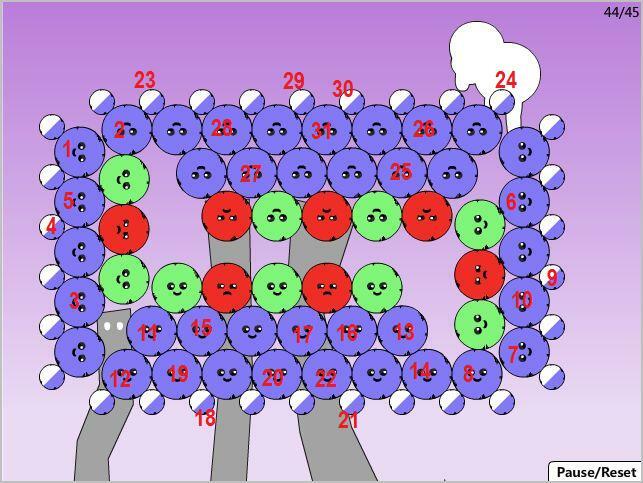 Here's a screenshot of level 33, you need to click on the block just as the structure starts to slip. The timing can be very tricky, it took me several tries to get it right. how do you unlock level 42? I need help with 31! I cannot get past level 39 on the bonus mode, i've been trying for two days!!! I cannot figure out level 44! Help!! Could some lovely person please post a screenshot for 44? Pretty please? Here's a screenshot of how I managed level 44. Remember to pause in between each click to allow the balls to settle. How do you do par on level 35? Here's a screenshot of par on level 35. The timing on this one is quick. Just click all three in that order with no pauses. Here's a screenshot of level 36 with the order that you click things. I don't understand PAR. It's not obvious how to obtain it on even the easiest levels. 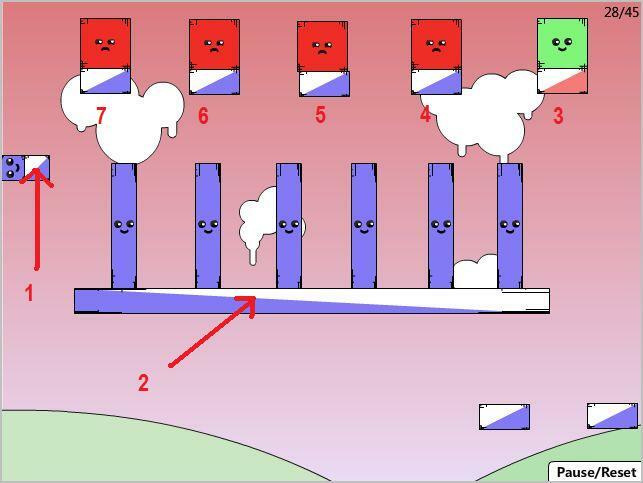 in level 6, I quickly click the left big blue block, the left small blue block, or both. However, the level completes but without PAR. In level 6, par is 1. 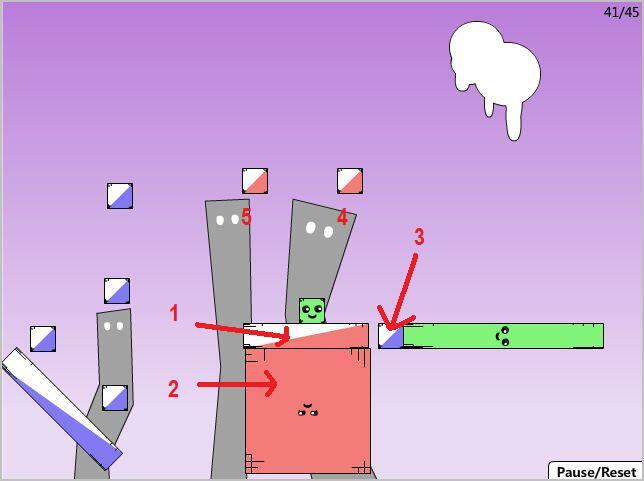 Basically, to make par you have to complete the level with only one click. Click on the big blue rectangle underneath the red squares, and they all fall away. You've just made par. 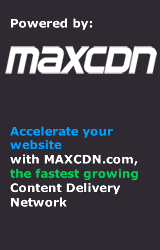 Check the par requirements before you go into a level so you know how many clicks you need to use. I'm stuck on level 39 can anyone help me? 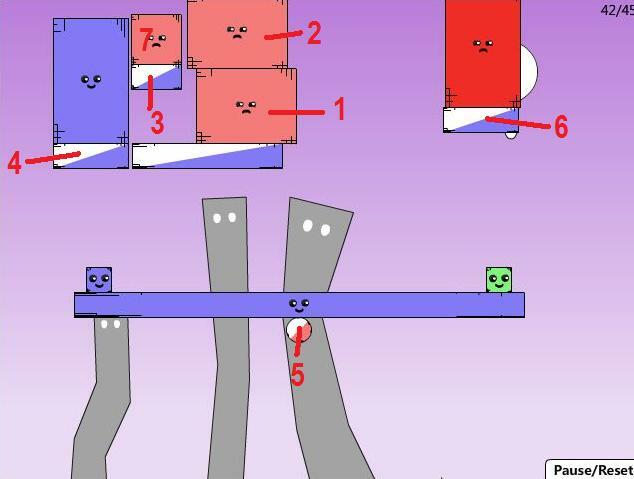 Here's a screenshot of level 39 showing the click order. The timing is crucial, so it may take you several tries to get it right. 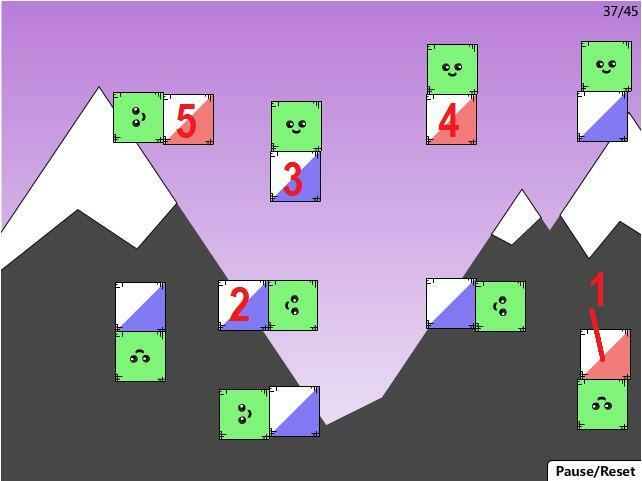 Demolish the first set of blue blocks immediately when the level pops up. 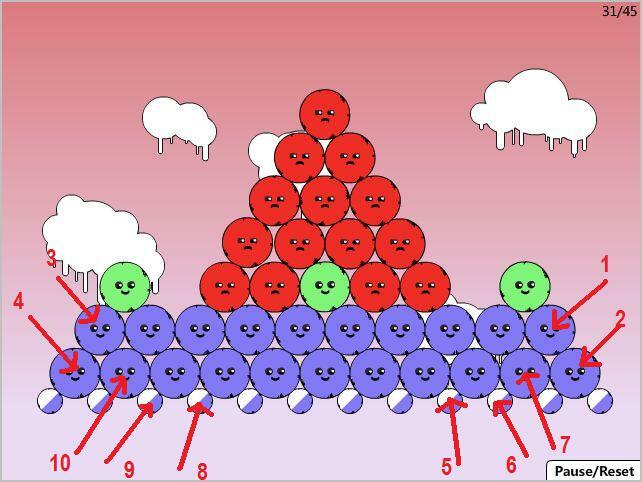 Demolish that first ramp immediately after the last red ball hits it, then start on the next set of blocks. Demolish that ramp immediately after the last ball hits it, and demolish the third set of blocks. 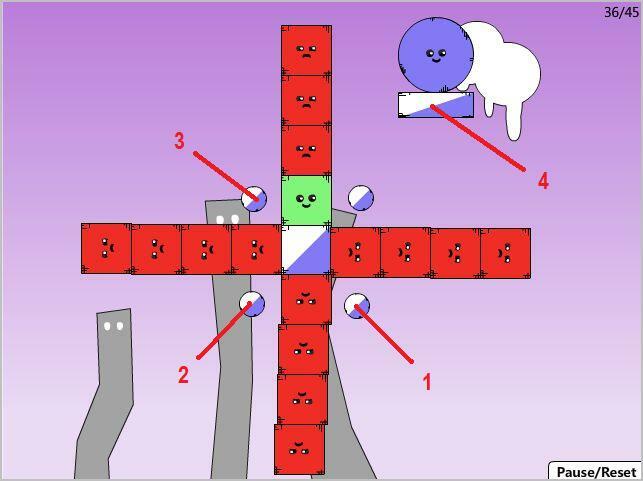 If you get the timing right, the last set of 3 red balls will get through the opening before the green block falls all the way down. i need help with 28, anyone? Here's a screenshot of level 28. Click on the first one, then wait for everything to topple. Once everything has stopped moving, then click 2. After all that has fallen then you can click the rest. HELP!! I cannot get past level 31 on par mode!! If you have any advice it would be greatly appreciated!! Can anyone speak Russian and translate the broadcast? How do I do level 31? Here's a screenshot of level 37 par. How do you solve level 42? Will someone please post a screenshot? Would be helpful. Thanks! About level 42, here's a labeled screenshot. Here's the directions: Click on the two big light red blocks (1 and 2) to remove them. Then click on the narrow blue/white block underneath the small light red (3) block to drop it down onto the larger blue/white below. 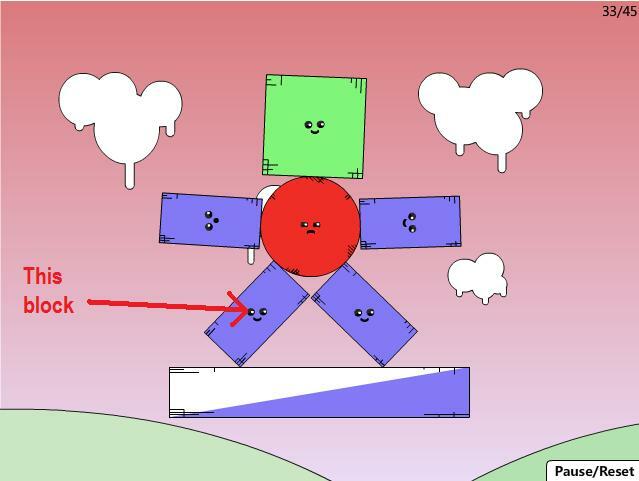 Then click on the small blue/white block beneath the large blue block (4), this will cause it to drop in the long one below and throw the green block up onto the blue white block above (the small light red box will keep it from falling). Once that is done you can click on the small circular red block (5), the small blue/white block that holds up the large dark red block (6) and finally just click on the small light red block (7) to remove it. Can someone help with level 32? anyone have a spoiler for lvl 21? lvl 25,28,31,33 need them on par - how? 36 is just as easy on bonus as regular. remove the bottom right, bottom left, and top left small blue balls, and let the big blue one fall. 1. Get rid of the four blue circle bottom triangle corners. 2. Get rid of the two pins holding up the triangles exactly in middle of the triangle bottoms. 3. Remove the rectangle holders so they can blast off the red circles. I need help for getting par on level 20. I got par on all the other ones. I finally beat Red Remover Woohoo! I'm in medical school and this site is the only site not blocked!! Yay, took me a few modules. How do you solve puzzle 58? For the love of god. How do you do 34? 45... is... hard O_O help please. can anybody help me with level 10? I have completed it in PAR and on bonus mode so why is it not letting me un lock the other 5 down the bottom end:S? can i have a screen shot of level 32 ? screen shot for level 40 please ??? Please screen shot for 31 in par? I cannot complete level 44 in par mode and/or bonus mode. I need help badly as this is the last level I can complete. I would love it if whoever can reply quick. P.S. I ADORE this site. It has given me many great walkthroughs and games to play. Thank you Jayisgames!!!!! !